Summer in Miami means ………time to get out of Miami. While the rest of the year the world comes here to vacation, Summer is the time when the tourists leave, the rain comes in, and we get out of town. And perhaps the best part of living in Florida is having so many world-class beaches and beach cities to escape to for the weekend. Just up our eastern coast of Florida sit three cities - Jupiter, Cocoa Beach and Sebastian - each offering something different for a short weekend away. And if you’re headed that way this Summer, here’s what you should be doing, where you should be staying, and most importantly what you should be eating. You might think of Jupiter as that place where people who can’t take the hustle and bustle of West Palm Beach move and commute. But really, it’s the first stop to natural Florida outside the SoFla megalopolis. The pace of life is slower, the water is cleaner, the beaches are less crowded, and there’s actual wildlife that’s not surrounded by condos. For the closest of our weekend escapes, here’s a quick look at what to do in the northernmost town in Palm Beach County. Jupiter, you might be surprised to know, has a good amount of historical significance. The Coast Guard Station here was a major lookout point for German U-Boats during World War 2. The boats responsible for finding them left from near the Jupiter Lighthouse, which is open daily for tours and spectacular views of Jupiter and the Atlantic. The Intracoastal Waterway in Jupiter has some of the best paddle boarding in South Florida, where you can board through mangroves and calm waters while seeing egrets, manatees, pelicans, and other Florida wildlife from the leg-aching comfort of your paddleboard. Just off Jupiter inlet sits DuBois Park, one of the most unusual parks in the state. It’s central feature is a sprawling lagoon with a sort of “lazy river” that goes through it. So it’s kind of like going to a water park, just without the slides. And the water gets flushed out. If you’re a diver, the must-dive spot here is the Jupiter Wreck Trek, a site where three sunken ships sit within a short drifting distance from each other 90 feet below the surface. If checking out three completely different wrecks in one dive weren’t enough, in August and September the Goliath Grouper Aggregation takes place here, which also attracts Bull and Hammerhead Sharks. Little Moir’s Food Shack, or just Food Shack for short, is THE must-eat spot in Jupiter. Nestled in a nondescript strip mall next to a Publix, many locals will tell you this is the best food in Palm Beach County, with stuff like tandoori seared sea scallops, the “Shack Bowl” with mixed veggies basil cilantro toasted garlic & noodles with coconut milk lemongrass galangal kaffir lime broth, and the legendary chocolate WHOISWHATZIT for dessert. Generally, hotel restaurants aren’t the top recommendation when visiting a Florida beach city. But Sinclair’s at the Jupiter Beach Resort is far and away the top pick for white tablecloth dining. The beef tenderloin with garlic mashed potatoes and the Tuscan chicken with balsamic glaze set nicely against the view of the beach. And the chef has daily specials based on what local seafood is in season. And no trip to Jupiter is complete without a stop at Square Grouper, one of the most iconic outdoor drinking spots in Southeast Florida. The lighthouse sits right across the inlet, and live music plays almost all day while you sit under waterfront tiki huts and try to figure out if you’re in Palm Beach County or the Keys. 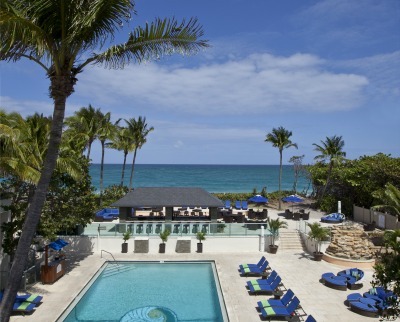 In addition to having the best formal restaurant in town, the Jupiter Beach Resort has a Tommy Bahama-themed interior that’s the perfect relaxing backdrop to your stay. It’s also got an all-amenity spa, swimming pool, and ocean views make from most of the rooms. And if this guide has got you thinking, “I should really go check Jupiter out,” they even offer a “Livin’ la Vida Local” package where they’ll take you paddleboarding, to the lighthouse, and give you free beach cruisers and ground transfers throughout Jupiter. For a stay more convenient to the water sports of the Intracoastal, stay at the Jupiter Waterfront Inn. This cozy, 38-room waterfront property has Jacuzzis in 10 of its suites, a pool deck right on the Intercoastal, and a location central to everything you’d want to do in Jupiter. Just an hour or so from Orlando sits Cocoa Beach, described by one Central Florida native as “a gem in the middle of some seriously (messed up stuff)” Cocoa, in addition to being the best-known surf spot in the state and hometown of legendary surfer Kelly Slater, is also home to one of the best beach parties in Florida and the closest beach to Orlando’s theme parks. 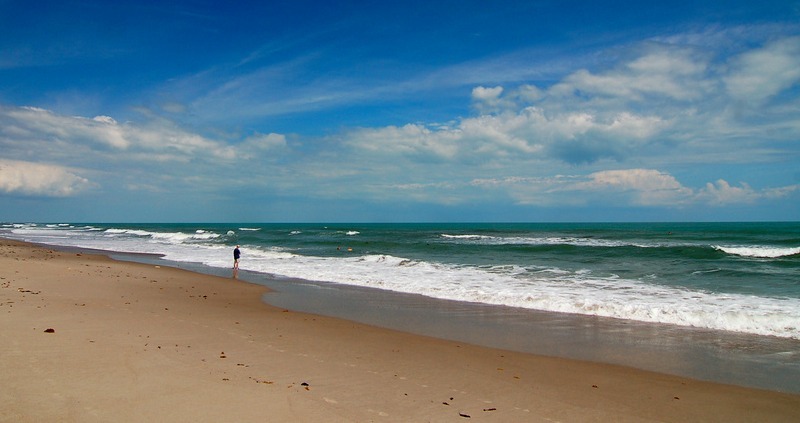 Which you’d never guess when enjoying the true beach-town feel of Central Florida’s best beach. No, the Kennedy Space Center does not have a Major Nelson exhibit. Since the “I Dream of Genie” character was fictional and all. But Cape Canaveral is still worth a visit. In addition to being home to the Astronaut Hal of Fame, it’s also open for tours where you can see space shuttles, control room mock-ups, and if you’re lucky catch the launch of an unmanned space flight. If you’re more inclined towards nature than science, Cocoa’s got a lot more than just the beach. For an area its size, Cocoa Beach has the most manatees of anywhere in America, and they’re most readily visible at Manatee Cove Park, Manatee Sanctuary Park. 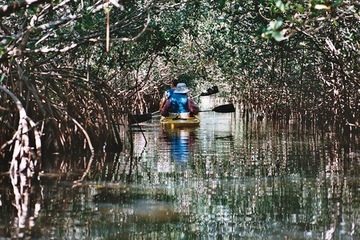 If you want to get out on the water and try and spot sea cows, kayaking through 1000 Islands and onto the Banana River is the best way to do it, and gets you a workout. 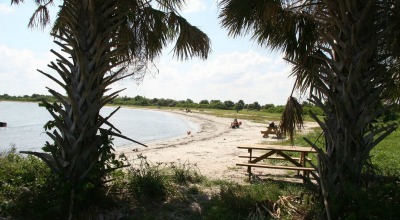 Lori Wilson Park features sand dunes and a natural maritime hammock, for a more-undiscovered beach feel. And Alan Shepard Park at the end of SR-520 provides your best shuttle launch and oceanfront views. Once you’ve experienced some of the scientific and natural offerings in Cocoa, head to Cocoa Village, a Coconut Grove-reminiscent historic strip on the river that’s full of unique restaurants and specialty shops. Also, if beachside nightlife isn’t your thing, Cocoa Village has regular live outdoor music performances and plenty of bars. You know about the beach, and the surfing (including the Ron Jon surf shop), and the beach parties, and probably even the pier. But this year the Cocoa Beach pier is getting a major facelift and a couple of new restaurants and bars coming in. So while this summer it might not be the main attraction of the city, keep a lookout for more. Not to be confused with his Hawaiian cousin Big Kahuna, Fat Kahuna’s is a Hawaiian themed corner spot heavy on seafood and inventive tacos (think pulled Hawaiian pork with coconut rice, black beans and homemade salsa) but the burgers are also among the best in Cocoa. The Dumpling Nerds might be the closest thing to an urban “food scene” you’ll find in Cocoa. Which is awesome because you can get inventive stuff like philly cheese, kimchi or chicken wasabi dumplings steamed, deep fried or pan fried for only five bucks. Coconuts on the Beach isn’t necessarily the best food in Cocoa. But it is the best dining scene if you want to eat in the middle of a giant beach party. Seafood Atlantic is a fresh seafood wholesaler where you can go and pick out your own cut. But better than that, you can enjoy caught-that-day seafood in their waterfront location just up the road in Port Canaveral. Most of the hotels you’ll want to stay at in Cocoa are on the beach. 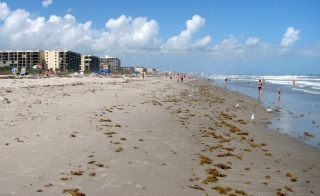 And while most are interchangeable, the Inn at Cocoa Beach is probably the nicest and least like Spring Break. Each of the 50 individually-decorated rooms has a private balcony, and the property boasts relaxing courtyards and beachfront access. Nearby, you might also want to look at the Resort on Cocoa Beach, the Beach Island Resort and, surprisingly, the La Quinta Inn Oceanfront. Sebastian Inlet is - at least among surfers - known as the best surfing spot in the state. But what most don’t know is it’s much more than just a place to go catch some waves. 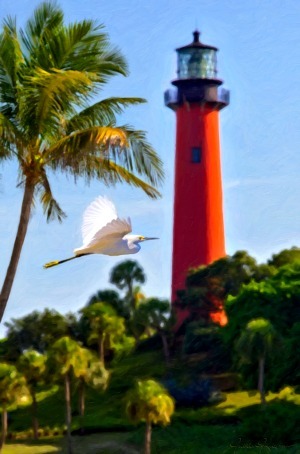 Sebastian Inlet State Park, as well as the town of Sebastian around it, has more to offer than surfing. Granted, it’s not as big as Cocoa, but for a couple of days of nature, quiet, and good surf, nowhere in Florida beats Sebastian. You’re in Sebastian. You’re gonna surf. And when you’re done surfing, you’re gonna dive. Just remember that the waves here are not for beginners, and all divers need to be within 100 feet of a dive flag. The surfing and diving all goes down at Sebastian Inlet State Park, which is the area’s main attraction. In addition to the aforementioned diving and surfing, the park has three miles of pristine, protected beach (that means no condos) and three mountain bike trails. And, yes, the term “mountain” is used very loosely since, after all, this is Florida. You can also fish for snook, redfish, bluefish, and Spanish mackerel off one of the park’s jetties. The park is also home to the McLarty Treasure Museum, where you can learn the story of the 18th century shipwreck that gave this part of Florida the name “Treasure Coast.” Also in the park is the Sebastian Fishing Museum, which teaches about the fishing industry in Central Florida. America’s first national wildlife refuge - Pelican Island - is one of the best bird watching spots in America and is just off Orchid Island in the Indian River lagoon. While nobody’s calling Sebastian a culinary destination, The Mo-Bay Grill is easily the best meal you’ll find in town. Chef Wesley Campbell, who’s cut his teeth in luxury resorts in Jamaica and his own spot in Washington D.C., brought his talents to Sebastian and serves what he calls “Jamaican International Cuisine” - a menu full of stuff like the spicy ”I” Tal vegetable stew, Jamaican curries, and of course, plenty of jerk. Captain Hiram’s resort boasts both The Sandbar and the Riverfront Restaurant. The Sandbar has three bars with views of the ocean, including a rooftop spot that lets you look out over all of Sebastian. 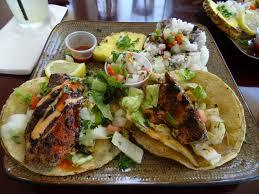 The Riverfront Restaurant is all fresh seafood ,and will cook up anything you catch during the day. For the rustic experience, you can’t beat camping at Sebastian Inlet State Park. They’ve got full water and electrical hookups, if you’re not THAT much into roughing it, and even free Wi-Fi from select spots. They’ve also got “primitive” campsites if you want to really rough it. Most are hike-in sites, though, so don’t plan on braving the elements with your car’s AC. Captain Hiram’s is the opposite end of the spectrum, as it were. The nicest resort in Sebastian offers waterfront balconies where it’s not unheardof for dolphins to swim up right next to your room. Their tropical mini-suites look out on the marina or river, and they’ve got a giant pool along with all sorts of watercraft rentals to take on the river. For something between “dirt floor” and “luxury resort” there’s the Davis House Inn, a converted mansion on the river that’s been added on to to create a cute, comfortable hotel with a distinctive Old Florida feel. It’s convenient to the park, and a closer, nicer alternative to the motels outside town.